Just to correct some grammar from recent discussions- as WST correctly pointed out, the vocabulary for secreted paracrine cell matter of MSC´s and MSC precursors after activation, are nowadays called "extracellular vesicles". Eric Duckers called ADRCs in the past "a Cytokine factory" and was referring to same matter, having the largest therapeutic impact in patients. The image below gives a good overview of the differences in size. Extracellular vesicles are membrane surrounded structures released by cells in an evolutionarily conserved manner. Their diagnostic and therapeutic exploitation is under intense investigation. 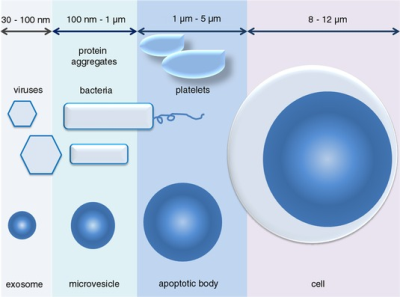 Extracellular vesicles roughly fall into the size ranges of viruses, bacteria and platelets. This must be the next stage of development and presumably will also be attractive for BP, since the product can be surely patented and the technology seems to fit in nicely with the MiRNA technology which Cytori moved inhouse about 3-4 years ago. Anyway- today I bumped across a paper which nicely seemed to elaborate all the variables, chances and potencies of the technology. I will eat my wooden shoes, if they refer to something different. Mesenchymal Stem Cells (MSCs) are effective therapeutic agents enhancing the repair of injured tissues mostly through their paracrine activity. Increasing evidences show that besides the secretion of soluble molecules, the release of extracellular vesicles (EVs) represents an alternative mechanism adopted by MSCs. Since macrophages are essential contributors toward the resolution of inflammation, which has emerged as a finely orchestrated process, the aim of the present study was to carry out a detailed characterization of EVs released by human adipose derived-MSCs to investigate their involvement as modulators of MSC anti-inflammatory effects inducing macrophage polarization. The EV-isolation method was based on repeated ultracentrifugations of the medium conditioned by MSC exposed to normoxic or hypoxic conditions (EVNormo and EVHypo). Both types of EVs were efficiently internalized by responding bone marrow-derived macrophages, eliciting their switch from a M1 to a M2 phenotype. In vivo, following cardiotoxin-induced skeletal muscle damage, EVNormo and EVHypo interacted with macrophages recruited during the initial inflammatory response. In injured and EV-treated muscles, a downregulation of IL6 and the early marker of innate and classical activation Nos2 were concurrent to a significant upregulation of Arg1 and Ym1, late markers of alternative activation, as well as an increased percentage of infiltrating CD206pos cells. These effects, accompanied by an accelerated expression of the myogenic markers Pax7, MyoD, and eMyhc, were even greater following EVHypo administration. Collectively, these data indicate that MSC-EVs possess effective anti-inflammatory properties, making them potential therapeutic agents more handy and safe than MSCs. More seriously Fas, RNA was hyped as the next big thing some 15-20 years ago but little seemed to happen. Is MiRNA something different ? Another question is the lodge has had dosing questions in the past with regard to what Cytori was able to deliver and I generally accepted that each cell only had so many receptors so the dosing argument wasn't necessarily a issue. Do you see this newer approach a attempt to now address that issue or just a better delivery system or perhaps even both ? Hedge- to answer your first question, I prefer to simply copy and paste, the description of the Sistemic technology which is published at LinkedIn- mind you, I did write in 2012 about them, since -after Tigenix- Cytori also adopted the technology, but I never could sass out very well how this would fit within the Celution process...probably not at all, but now-anno 2017- this write up does seem to make some sense, when extracellular vesicles and off-the-shelf products are considered in regard of their development and QC. Does that mean Cytori has already 4-5 years R&D in the area and Azaya was a gift from heaven? Now- that would be nice for a change. Sistemic is a product development company that leverages the instructive power of microRNA (miRNA) to provide leading-edge products for the Bioprocessing, Cell (and Stem Cell) Therapy, and Drug Discovery and Development markets. Sistemic provides a broad range of products from robust quality control (QC) for cells to toxicity and drug response based products for Pharmaceutical markets. These products are helping companies worldwide to deliver drugs and therapies successfully and in a cost-effective manner,whilst providing knowledge-rich and instructive data on a range of cell systems. Sistemic’s pioneering products are centred around the company’s IP and core expertise within three areas: robust miRNA profiling, superior statistical analytics and multi-layered contextual analysis. Together,these constitute the Sistemic Methodology. Sistemic leverages the instructive power of miRNA. MiRNAs are seen as the master controllers of a cell and provide information on the effects within a whole cell or organism rather than an isolated pathway. This systems approach means that the data produced is more indicative of the biology and more informative of actual effect. The Sistemic method provides a rigorous yet rapid understanding of the biological changes that occur within a cell. Resulting data allow companies to make well-informed decisions. This enables them to develop their cell (or stem cell) therapies and drug development pipelines more successfully and more cost effectively. The second question is way beyond my knowledge in order to give you an authoritative answer, but just guessing a bit by saying that of course one can QC control what one inputs, but one never knows exactly what type of receptors are available at the site of injury and key is to change thru binding or signaling to change the metabolism- or activity of a cell. To me that remains trial and error to find out what works. To be honest, I forgot about the Sistemic angle and Cytori's history with them. Thanks for clarifying. I figured we were basically referring to the same thing. The number of studies in exosomes has soared exponentially over the last few years so there is already a ton of competition out there with a head start. The interesting thing is that although extracellular vesicles are secreted from stem cells they are not considered a cell therapy and thus are even a more attractive business model than an allogeneic cell therapy if efficacy is shown. Problem for Cytori is that they would basically need to start from scratch to develop data to take this anywhere and that costs a ton of money. They can't just convert a successful ADRC autologous scleroderma clinical trial into an off the shelf exosome therapy. Its an entirely different therapy. As I have stated before- the basic knowledge that culture media, has in preclinical studies, the same impact as cells either delivered intramuscular or delivered locally is now already 8 years old. TeChung Lee´s hamsters.. Cytori knows that too. I do not think they are starting from scratch and have been at this for a while- the Sistemic link kind of points to that. To think that any of the trials in process will be switched to a different tech, I believe to be wrong. ADRCs will be around for at least 20 years longer accompanied by other developing technologies, which I believe is the way to go. I am pleased - and have put my bets on the table. In Hedrick's call on 1/19, he indicates that CYTX has been working on "cell free regenerative off the shelf regenerative medicine" (druggable regenerative medicine) for 15 years and I think this is where there is a synergism with AZA. In this presentation, he feels that the AZA marriage would generate partnership opportunities, which are absent with the celution system in OA, cardio etc. In relationship with the celution system, there has no new efforts in the US for what have been planned. I think CYTX maybe very lucky with the scleroderma niche indication, as well as various indications being tested in Japan. The main outlet for the celution system may very well be Japan and other Asian Pacific countries. To think that any of the trials in process will be switched to a different tech, I believe to be wrong. When I said "starting from scratch" I was only referring to the regulatory path to gain approval. I agree with you that nothing in progress will be switched in mid stream. It just doesn't work that way. Right...this would be a 2020's timeframe product. So 5 years down the road or so. Near term assuming the deal is completed this month as planned is finding a partnership for the chemo products. Cash still #1 issue. If they got rid of that debt I bet the market cap would pop $30-100 million. Thank you everyone for the interesting and civil dialogue concerning the development and application of extracellular vesicles (EVs). It is very likely that at some date in the future this may well be the way to treat a multitude of conditions. It will clearly be an off the shelf drug with all the benefits that that provides. However lets not lose sight of the fact that those "secretions" derived from ADMSC are just that ......... derived from adipose derived mesenchymal stem cells. Celution generated ADRC will be ready to go earlier than the products derived from this new research. Lets not forget also that the SVF contains a lot of additional cells that may be/are relevant to the healing process. The evolutionary development of the human body is not a random event with lots of rubbish constituting part of our cellular makeup. There is a reason that the SVF contains this particular complex of heterogeneous cells. It is what it is, because it works, or alternatively it works because it is what it is. The rate of understanding and technological expertise concerning the cellular makeup and activity in the human body is expanding at a geometric rate. There has been a lot of secrecy on the part of the company about what it has been doing. Lets hope that Fas is right and that CYTX management has been up with the play in terms of development and technological change. As regards CYTX collecting Celution machines that were distributed around Europe I find it to be a strange and difficult exercise to undertake. If true, I can only see this as being proof of impending positive good news in the Scleroderma front. Why? If the therapy works there will be a large time gap between data result reporting and regulatory approvals (multiple regulatory authorities/countries). There will also have to be a considerable amount of time required to organize distribution, reimbursement and pricing. If you want to have an optimal pricing strategy, given a relatively small patient pool, it is unlikely that you would want to have multiple machines out in the market currently available for cosmetic surgery being available for use in the medical treatment of scleroderma/sclerodactily. I have always feared that a generic autologous ADRC - SVF dose can be can be applied easily across a range of conditions/ailments. With the machines out there, CYTX would be facing competition from itself (own machines). Plastic surgeons could undertake the treatment of patients and discount the price of treatment to levels patients would be prepared to pay on a self pay basis. That would be a regulatory,partnering and marketing nightmare for CYTX. Is it just possible that ADRC are too good and Celution to simple to operate for Cytori's own good. Is it not a regulatory nightmare for authorities if anyone with a Celution device could undertake the practice of medicine on the cheap. Great movie, oldie but goody. I will have to re-visit that call for the 15 years bit- that sounds astonishing and why that was never in SEC filings. Rongside, excellent post - however, I disagree with the section that relates to collecting the existing machines in Europe because they may be converted to scleroderma use at much lower pricing - you state that "I have always feared that a generic autologous ADRC - SVF dose can be applied easily across a range of conditions/ailments." -- that statement basically ignores the "gemisch" which is different for every application - if what you said was true, why don't we still have a viable cardiac application? A couple more things on this topic that I see as misconceptions. The idea that any new technology related to exosomes and extracellular vesicles would be autologous, flies in the face of reality. That's just never going to happen, IMHO. There will be no need for manufacturing hundreds of Celutions if this becomes reality. All you need is one. It is also hard to see how Cytori has any defensible IP on this. Also the idea that EV's derived from ADRCs are somehow better than other sources is pure undocumented speculation. If anybody can prove this, I'm all ears. Wall Street Titan wrote: A couple more things on this topic that I see as misconceptions. The idea that any new technology related to exosomes and extracellular vesicles would be autologous, flies in the face of reality. That's just never going to happen, IMHO. There will be no need for manufacturing hundreds of Celutions if this becomes reality. All you need is one. It is also hard to see how Cytori has any defensible IP on this. Another question for the board is why would extracellular vesicles need to be encapsulated in the first place. They are not unnaturally encapsulated when the are secreted from stem cells. I don't know the answer... just asking the question. This suggest uptake may be the need. Thanks hedge. In this Capricor mouse study, the exosomes were injected directly into the heart near the infarction area: capricor.com/wp-content/uploads/2014/04/Exosomes-as-criticial-agents-Ibrahim-2014.pdf . No encapsulating was done although it was not an IV delivery. While I indicated in my last post that I agreed with WST that any off the shelf drugs would not likely be autologous, I went back and listened to Hedrick's presentation on 1/19 - he clearly stated that the off the shelf drugs that they will work on would represent improvement over allogeneic cells. DO NOT UNDERSTAND THIS COMMENT BY HEDRICK? rodney.strongg wrote: While I indicated in my last post that I agreed with WST that any off the shelf drugs would not likely be autologous, I went back and listened to Hedrick's presentation on 1/19 - he clearly stated that the off the shelf drugs that they will work on would represent improvement over allogeneic cells. DO NOT UNDERSTAND THIS COMMENT BY HEDRICK? Go back to my "druggable" topic. There I explained that the extracellular vesicles do not have genetic material "on board", so there will not be an HLA (Human Leucocyte Allergen) reaction, which almost always occurs with allogeneic cells, albeit " they say" not a serious one, which I always have viewed differently based on statements from somebody who had worked with cells since 1990.